Joseph Avski’s Heart of Scorpio, translated from the Spanish by Mark McGraw, offers a bittersweet meditation on the trappings of fame and its discontents. Using the rise and fall of real-life fighter Antonio Cervantes Reyes as a template, the novella follows the meteoric ascent and tragically delusional crash of a fictional Columbian boxer named Milton Olivella.Haunted by the promise of his early career, Olivella has, by the start of the narrative, long since become a ghost of his former self, yet can’t stop imagining the glorious comeback that awaits him. He just needs to clean up his act, just needs to get back into training, just needs one more chance, and the world will once again be his. Needless to say, Julian, who’s been a first-hand witness to his father’s complete emotional, physical, and financial collapse, isn’t buying what the former champion is selling. Yet Julian is deluded in his own way. Born at the height of Olivella’s popularity, he lacks the motivation to make a life for himself outside the boxer’s shadow. Instead, he wallows in self-pity, wishing he had the money, the clothing, and the social standing to make women want to “hit the sheets” with him—a phrase the character utters almost incessantly throughout the novella.That Olivella and his son eventually come to blows comes as no surprise. Theirs is a world where nearly all disputes are settled through violence. More often than not, however, it’s a tragic, desperate, impotent brand of violence that ultimately and without fail ends in self-destruction. 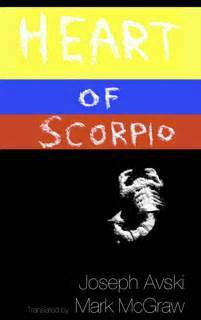 There’s no winning, Heart of Scorpio seems to argue on every page. The best we can do is to wrap comforting narratives around the myriad failures that life inevitably delivers.